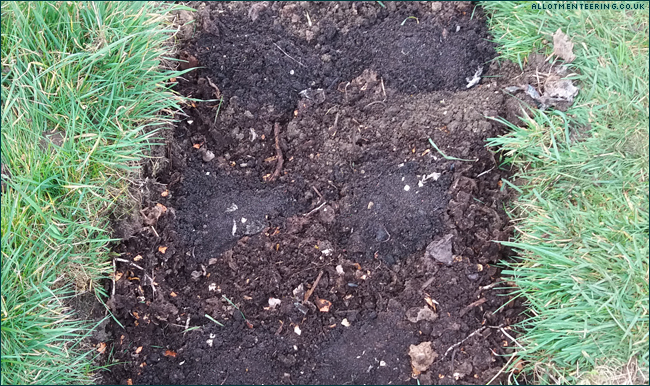 Several weeks ago, I ordered a new raised bed – I thought the plastic corners would help make it more sturdy. After a couple of phone calls to chase the company, it finally arrived this week, so I was looking forward to getting it all set up on the allotment. 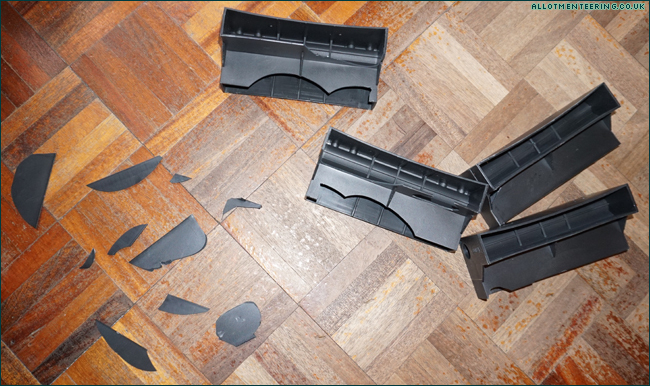 There was a slight problem though… the plastic corners were all smashed to pieces. So we’ve now arranged to take this piece of rubbish back to the store for a refund, and I’m still needing to find a decent, sturdy metre-square raised bed! Anyone got any suggestions, given that my DIY skills are lacking at being able to make my own? 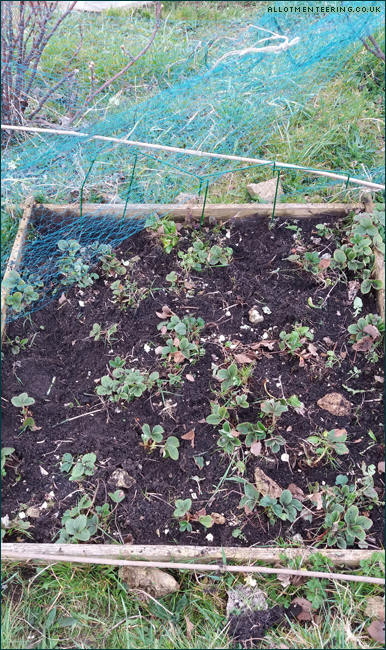 The strawberry plants on the right are the Just Add Cream ones, and I planted out four Snow White on the left of that raised bed yesterday – they look absolutely minuscule, but these are the biggest four so far! According to my half-written allotment diary from last year, we were already picking rhubarb by this point. It’s way too small to pick right now, but it’s all growing really well so hopefully it won’t be long before Rhubarb Crumble season starts! No photo of the main potato patch, but this is the overflow patch! 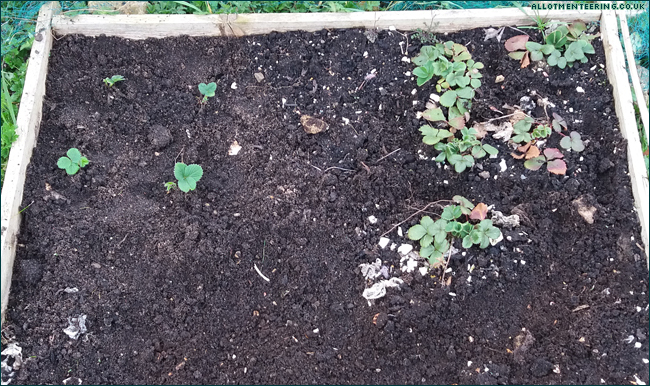 I have read that you can put black polythene down on the soil surface to save the need for earthing up the potatoes, so if I can find some I might give that a go once these sprout through the soil. The peas were looking a lot healthier than the spring onions, and I decided it was time they were planted out. The label on the pot just said “plant out as soon as possible” which was really informative! 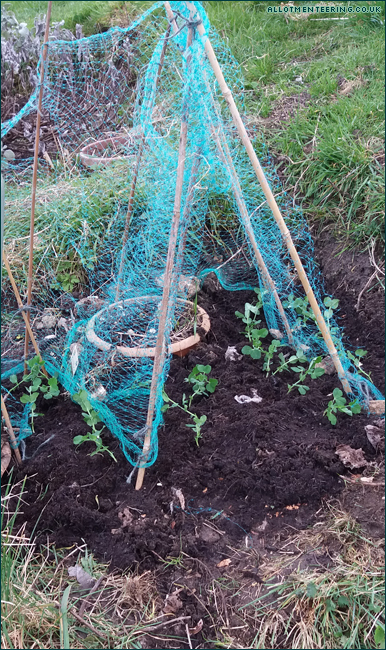 I’m hoping that the way I put the netting in a zigzag will mean it’s not too challenging to pick the peas (assuming they grow!). 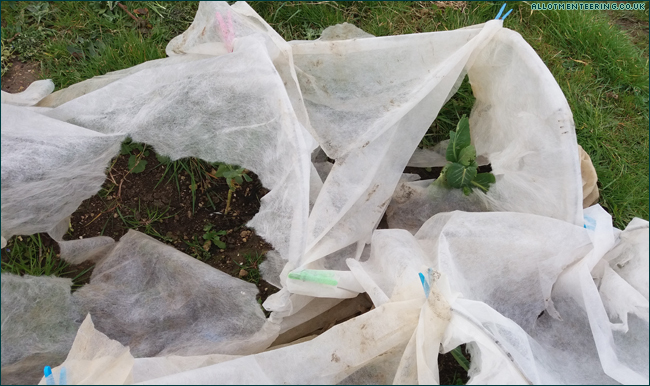 And finally, I have no idea whether it was a deer, badger, the wind, or just the cabbages wanting to escape, but I think we need to work on replacing the fleece covers! Here’s hoping for some more dry weather, so the plants can recover from all that cold and snow last month. Don’t forget to check out the Propagator’s Six on Saturday and read through the comments section for more blogs to check out! Mmm hopefully that rhubarb crumble and custard won’t be too far away for you. It definitely has to go with custard! If you really can’t fix four lengths of wood together, then there are lots of places that sell kits. Harrod Horticultural (http://bit.ly/2uS4zFo) have a range of sizes and are currently offering 10% off. Dobies have some cheaper options, including http://bit.ly/2uTwHYx which is a metre square. These are only two places, though; there are many more. I tried for my half-size raised bed and kind of got four lengths of wood fixed together…. but it was quite haphazard on the accuracy of the nails! Originally I wanted to cut slots to just slot the pieces together, but that was a total failure, hence needing to nail them together instead. Yes, my rhubarb is well behind too although I have some in a forcer which are ahead of the others. The crumble will be worth the wait. I also make rhubarb cordial which would probably be subject to the sugar tax if I were ever to sell it! 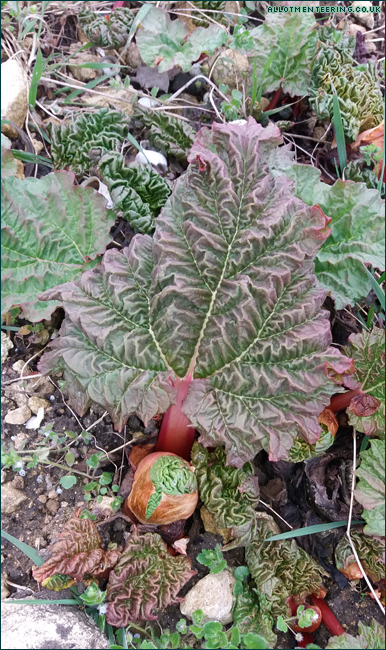 I’ve never tried forcing rhubarb – maybe next year that might be worth a try, given how many plants I have! Rhubarb cordial sounds like an interesting make – is that hard to do? Really sympathise with the lack of DIY skills. Shamefully, I enlist the help of others. Can you do swapsies? DIY time for plants? A cake? A winning smile? The person on the plot next to mine is a whizz with woodwork…. I haven’t actually asked him outright, but I dropped a few hints about being stuck for a raised bed (and being unable to make my own) and just got told “it’s easy, just nail the boards together”. He did kindly supply me with the wood he had lying around in his shed, which ended up being my 1/2 sized raised bed. But swapsies for plants does sound a neat idea if I can find someone willing! Smugness alert: I picked and ate my second lot of forced rhubarb last week. My mother in law gave me a forcer a few years back. Big pottery thing. But a bin, or some such, does the job too. Oh, the rhubarb looks so good! What you need is a cheap chest of drawers w/the back out of it – start stalking student housing dumpsters. Take out the drawers & there’s your raised bed. The drawers can be used as smaller planters for herbs or flowers or lettuces. (Yup, I’m cheap as cheap.) Your cabbage saga is intriguing (let my cabbages go). If you find out who the culprit is, let us know. And your rhubarb looks so lovely! Things are happening, now that we’ve had some sun.